You are the owner of a small business, you want to get more benefits from your business, right? You have a Smartphone, Fablet, Pad or Table with Android Operating System? If yes, you can easily get more benefits from your business by using some free and premium Android Apps. You can easily do some of your business tasks using these apps from anywhere, anytime. There are several Android Apps for Small Business available that are easy to use and simple to track all of your business activities. Just install these apps on your Smartphone or tablet and use them properly. This is on the top of my list of Android Apps for Small Business. The OfficeSuite 7 + PDF to Word is one of the most popular and No 1 mobile office editing apps for Android devices. You can easily edit your office documents using this app. The latest version of the app have advantage to convert PDF file as word document as well as convert word documents as PDF file. The Facebook Pages Manager is also another popular Android app that will help you to grow your small to large size business in online. With the help of this app, you can easily manage, post and update your Facebook page easily and quickly. You can also comment and reply on your page posts quickly. Google Drive is a fantastic and one of the most important Android apps for small business owners. You can easily store data on Google Drive and download, update anytime, anywhere. Just install the app and sign in with your Google Account. You can easily edit your office documents with the help of OfficeSuite 7. The Local is a fantastic app for the corporate person as well as job holder. It is another option on my list of Android Apps for Small Business. The app automatically puts your android device silent when you are in an office or a meeting. It also turns your phone bump when you are at home. The app works depend on your local setting. 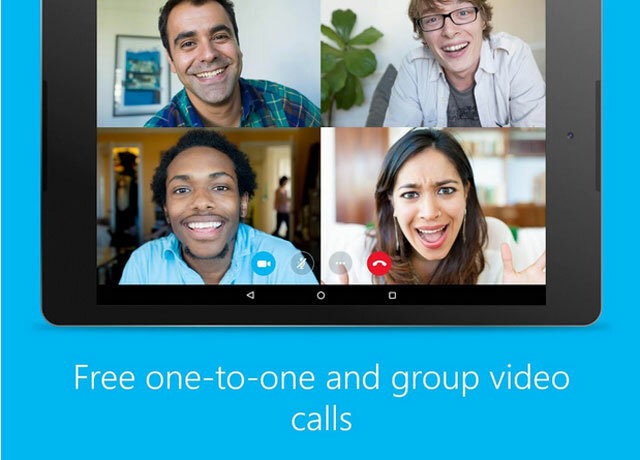 Skype for Andoird is an inevitable choice on the list of Android Apps for Small Business. You may need to contact with your employee through voice call or video call when you are out of the office. The Skype for Android makes it easy to connect with your employee or family member anytime, anywhere. Just install the app and sign in with your Microsoft account or Skype account and enjoy free voice and video calling. Dropbox is another popular cloud storage company comes with multiple function and features. You can use the free version if you need low space. Easily download, upload and edit your files and documents with the help of Dropbox. The CamCard is a fantastic business app for corporate or business person. It is not easy to store a lot of business cards or visiting cards. The CamCard helps you to collect business card information to your Android phone or tablet. For small business owners, Microsoft Remote Desktop is a must have Android app that will help you to control your PC/Laptop using Android device. The Evernote is a simple note taking Android app to organize your daily activities and keep activity records. The free app lets you dictate or manually enter notes, snap photos, create to-do-lists and much more. With the help of Cloud Print, now you can easily print your documents through the wireless printer. You can directly print documents from your Google Drive through the app. These are some of the Android Apps for Small Business I can mention here right now. There are more out there but I know one or two of these 10 will help boost your business in one way or the other. So what do you think about my list of Android Apps for Small Business? Please drop a comment and let’s discuss. Thanks for list out the most useful apps for the small business. The Apps along with the description, images and feature are impressive. Thanks for stopping by and glad you liked this cool list. You can try some apps (Google Drive/Dropbox, Evernote, Local, etc.) from this list to manage and organize your daily tasks. Hope, these apps will help to increase your daily productivity. These days I am trying out proofhub and wrike for my projects and I really like both these tools. I think you must check out both these tools and add them to this list. Outstanding list. These days I am trying out proofhub and wrike for my projects and I really like both these tools. I think you must check out both these tools and add them to this list. Good list of top ten Android apps for small business. You have covered every type of Android apps. Thanks for stopping by and yes these apps are really helpful for small business owners to organize their tasks, increase productivity and ROI. Awesome article! Surely these are the apps every small business can use and luckily most of them are free, I love Dropbox the way it works. These apps can be essential for small business owners and they can also use as almost all apps are free. You have show something cool on this blog. I mean, people uses Smartphone for common usual purposes. But apps for business? This is really something new to me. Thanks for letting me know and for the suggestions. We can do several things with help of apps and our Android phone or tablet. Using the right Android app will help to save your time, organize your works and increase your productivity. Google Drive is a good service that I’m using everyday. It’s a great service to store my document files as well as others. Thanks for stopping by. Yeah, Google Drive is best to store files and essential documents to browse from anywhere. With Free 15GB Storage, this is really good service. But personally, I like to use DropBox. I think DropBox is more user friendly then Google Drive. Thanks Enstine, for making us aware to these amazing apps. Really glad to read this post. It’s simply awesome. It sure helps many people out there who are searching for the little help to grow their startup business at a higher level in online. Out of these apps you mentioned, I enjoyed the Facebook manager more. I use it to manage all my pages and also run ad campaign. I really like the Facebook pages manager app, it let me manage my pages on the go, I have everything within me on the go! Facebook is really a great platform for small business owners. Recently I start a small online based shop in my country and fortunately more than 85% customer comes from Facebook. Because I promote my products in Facebook and I can manage my ads from my Android device using the Facebook Page Manager App. This app really cool and user friendly. Recently came across some android apps for small businesses, found there is a great tool for productivity where, as you’re working the tree would continue to grow otherwise the tree would die out without work. Nice plugin good for small business. Article is Awesome. . i will try to use these plugin or tools for my business. I like your article. but this is too long. Yes you are right , this is modern time of smartphone mostly business are moving in Android App website view because they are getting good engagement with these users. so here you have shared this awesome blog post. In this modern era, We can utilize technology to make our daily tasks easy and comfortable. And smartphone is the best innovation of technology that we can use to make our tasks easy. Post was so interesting and seems so good 🙂 thanks for the efforts you took crafting such an awesome post ! I’ve bookmarked this page 😉 will trying out each and everyone in this post 😉 ! So awesome thanks a lot again 😉 Keep sharing stuffs related to android I will be glad to check them out when time permits me. Thanks for your valuable comment and glad you like this post. And I hope, you will surely try these app to increase your productivity as well as ROI in business. Great list, but I’m one of those people who sometimes feels overwhelmed by the amazing quantity of new things that are supposed to be making things easier. I’ve decided to take these one at a time and spend a few days trying to wrap my brain around each one. I was thinking of starting with Evernote because I’ve already got that on my phone. Does that sound like a good one to start with? Currently i am using facebook page manager for my business . Actually facebook have more active user then others. So i always use facebook to get traffics. Hi Fakharuddin Manik, welcome to enstine blog. You have really shared a nice list of valuablr android apps for small online business. Though I have some already installed but I can see some others you instroduced that m not aware of. It was really a Worthy and informative post. There is no doubt that in the recent years Smartphone usage has increased at an amazing rate. If you are setting up a new business or trade then you must use technology in order to deliver your ideas effectively. These are absolutely amazing application and one cannot think to smoothly operate their business without using these apps. I was also unaware that some of these apps also have an Android version. Thanks for sharing such an excellent idea of Android applications. At this time, We can see that there are so many companies launched android mobiles. So but obviously there are lots of android applications available in the market. Nowadays people can use so many android applications for their own lifestyle, fitness, health. Very good list of apps. They are really very much useful. Of the above few are completely new to and few I’ve not tried. Basharath recently posted…How to make free calls online from pc to mobile without registration? Nice informative post and currently I am using Skype from the list above and tried few like dropbox, Evernote but have to try remaining ones. They look like very useful so giving a try is not a big deal though 🙂 Thanks again for sharing this useful post. Hello Manik! I loved the list of these apps. These all are essential apps we might need of these app everyday. Are these apps available in apple app store also? Although the list could have been a bit longer. However, Thats a great list ! I feel Skype is one very essential and must have app for all. Keep writing some good stuff like this. Amrita Arora recently posted…How to Open a Bank Account in Bank of India ? Fakharuddin Manik ! Personally thanks for post this article .You have posted the best android phone .I have checked all phone future .All future is suitable for this type phone . It also a business dealing post .It also help small busniss. Google Drive and Evernote are my favorite apps. They always allow me to be productive, even during night time when I scroll my phone just to see how my team is working. Thanks for the list, I will install these apps to check how they work out for me. A great post! Thanks for sharing.Although the list could have been a bit longer. However, Skype is one very essential and must have app for all. I didn’t really use Evernote as I already use Microsoft OneNote which I think is better with functionality. It feels redundant. As a writer/blogger, I use Write-O-Meter app. I am not affiliated with this app in any other form but the is just awesome I have to recommend it. Thank you Fakharuddin. I’m never heard cloud print before. I would recomend Microsoft apps such as Words, Excel, PowerPoint, OneNote. It’s good choice to boost the productivity. Hi Fakharuddin, that is Great article. Thanks for suggesting and sharing these. This are very useful apps.But i think teamviewer is aslo deserve to be there for small Business because it is all-in-one Software for Remote Support and Online Meetings! what do u think about this??? Thanks for the post. A great piece of article, and useful too. I think One Note could be another helping hand since For starters, we prefer its easy-to-use interface. Google drive is very productive and useful; Got all my important files saved up and sync with the folder on my system. Nice review. I would also recommend Inbudget public budgeting, personal finance and money manager to track expenses for your business. Great Apps collection shared by you!!!! All Apps are very useful for personal & business use. The CamCard is a very useful App to store various cards in one place. Thanks for sharing & waiting for next update…..
Hemant Kumar recently posted…Blogging Apps: 11 Brilliant Apps Every Blogger Must Have [Android]. This is definitely a nice set of apps that almost any business can appreciate.Thanks for list out the most useful apps for the small business. The Apps along with the description, images and feature are impressive. Good work. Thanks for sharing……. That’s really good list of Android apps for small business. You have covered every type of Android apps. As per the nature of business, need of such tool will be vary. Definately this all tools are become essential when you are running business and want to make all things smooth. Really a great post. Well-researched list of apps that every small business owner should have. Especially I love the apps facebook page manager, dropbox, Evernote. One suggestion is that you could consider adding the ASANA to the list as well. Thanks for the great list dude. Keep up the good work. Great and outstanding list. These days I am trying out proof hub and write for my projects and I really like both these tools. Thanks for the shearing. I am waiting for your next post. Great list of android apps for business. Nowadays, mobile apps have become a great tool for all type of business as mobile apps help in better engagement with customers, keep customers connected and so on. Many Thanks for sharing this awesome & useful blog post about small business apps. I’m really addicted to android so I love finding everything on Android. Remote Desktop + Google Drive/DropBox are an absolute must, it means I can quickly solve just about any issue away from my desk at any location with an internet connection. Alex recently posted…Amazon’s late entry to Australia; Blessing or Curse? Google Cloud, Dropbox, Drive are always relevant to small business. I will recommend you to add skype or cam scanner. Skype is famous for calling purpose and camscanner for an instant scan. By the way, your Android apps list for small business is much helpful. The way you organised you contain and images are impressive. I would definitely like to share your contain. thanks though am already using some of these apps for my small business. But do I really need to dump these pps after my business might have grown big? Very useful post. Got to know many android apps which helps for small business. Thanks a Lot for introducing apps. Keep writing such informative posts. Great list of apps. My personal favorite is Evernote. I’ve been using it for years now. Just love the app. I am owner of some big facebook pages so I always consider Facebook Manager App, Every FB page owners should try this for sure, thanks for sharing this list buddy, As I got some useful tools for my IM business. Nice and Useful Post I like him very much and Thanks for sharing this with us. This is the right site for everyone who would like to find out about this topic. You realise so much it’s almost tough to argue with you (not that I actually would want to…HaHa). You definitely put a fresh spin on a topic which has been discussed for ages. Wonderful stuff, just great! The android applications in this list are a must have for a person who has or about to start a small business. These applications will not only ease up the job but will also help in keeping track of the documents,business related activities and also keeping track of websites and social media pages linked with it. One other application I want to add is the TeamViewer application for android, which will help in controling and troubleshooting small problems in your computer system from anywhere using an android phone. Thank you for writing this great article about the business app. I think all these apps are really useful. I personally use Google drive,Skype,Facebook Page Manager and Office Suite.I appreciate your style of writing.You have included all the features of these apps too. Hope we will get more articles like this in future. Very informative written by you Fakharuddin. I really enjoyed the read. Most of these apps are very useful both business and personal use. I hope you can update this article for 2017. I’ve bookmarked your site to come back and get informed. Thank you for taking the time to write this article. Great to see plenty of small business apps in a single post. I personally use an app called Dropbox, this app truly helps you manage your files. Thanks for sharing useful information. Thank you for listing out the most useful apps for a small business. You have covered every type of Android apps. I would recommend Drive and Evernote for daily use its a must have Apps on my list and I would add Google Duo in this list it is faster than Skype. Thanks for the best tips for Android Apps for small business. I use evernote daily for my personal works.